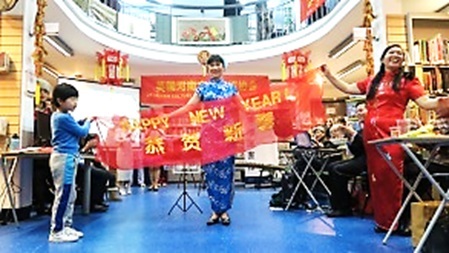 Charing Cross Library held a Chinese New Year celebration last Friday, 5 February. Over 130 people enjoyed fantastic magic shows, singing, dancing, networking and drinks. This year we worked together with Henan Associations, who brought us some interesting Henan local folk cultural elements. Chris Lloyd, Community Development Manager, presented a welcome speech. The Chinese Embassy Minister Counsellor (Economic & Commercial) Jin Xu and counsellor Li Hui attended the party and kindly wished all our customers a Happy New Year. The longest-serving Premier Minister of St Kitts and Nevis Denzil Douglas also attended the celebration and gave warm wishes of good relationships among British, Caribbean countries and China. This weekend the biggest celebrations of Chinese New Year outside Asia will take place in London: find out more. The beautiful and traditional art of Chinese painting holds a fascination for many. Charing Cross Library invites you to join in with their long-established Chinese painting class, held every Saturday from 11.00am – 1.00pm in the library. The class is taught by an experienced teacher, Mr William Cai, who has practiced Chinese painting for over 40 years – and has been teaching it in the UK for more than 20 years. He has served in various institutions such as the British Museum, the Victoria and Albert Museum, Missenden Abbey Adult Learning Centre, the University of Westminster, Imperial College and more. Adults of all levels of skill, from beginners to advanced, are welcome. Classes cover techniques including Xie Yi (which is a freely expressive style) and Gong Bi (highly detailed brushstrokes, very precise and without independent or expressive variation), and subjects such as landscape, flowers and birds. The courses also includes an introduction to and analysis of master works in Chinese painting, to help students understand and appreciate Chinese art. Through live demonstrations and hands-on exercises, Mr Cai guides students through to mastery of the basic techniques of Chinese painting, step by step. You can find out more by contacting the library or Mr Cai – more details on the Charing Cross Library events page. Charing Cross Library, although in a brilliant location, has never been the easiest library to find. Many customers have said they used to walk past for years without realising there was a library here, and this is not helped by our relatively narrow entrance. For the next 3 months it will be even more difficult to spot us as we are completely obscured by scaffolding from top to bottom while repairs to the roof are taking place. We will be open as usual! Don’t be put off by our appearance, come in and look around, like a tardis we are much bigger on the inside than on the outside. On Monday Charing Cross Library celebrated the opening of ‘A Narrative of Light and Shadow’ – a photographic exhibition running until 14 May 2014. The exhibition consists of 30 photographic works of both landscape and portraiture selected to represent the artistry of Taiwan’s female photographers. Displayed high on the first floor railings of Charing Cross Library, the works of Chang Hsiu-huang, Wang Hsiao-chin, Chien Fu-yu, and Chang Yung-Chieh offers visitors narratives of Taiwanese culture that is both stunning and thought-provoking. Those attending the opening event enjoyed a live performance by cellist and pianist Shu-Wei Tseng. 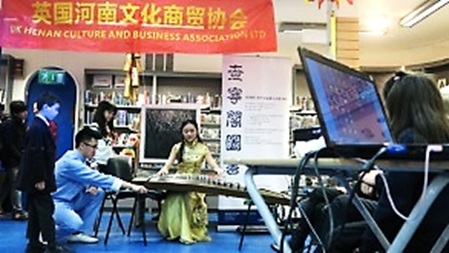 Speeches were given by Representative Hsu Feng-Chuan of the Taipei Representative office in the UK and Chris Lloyd, the Community Development Manager for Westminster Libraries. Chris thanked both Chichy Li (Chinese Library Team Leader) and the Taipei Representative Office in the UK for organising this beautiful exhibition and expressed his hope that this celebration of Taiwanese art and culture will encourage more members of the Taiwanese community to visit Charing Cross Library. 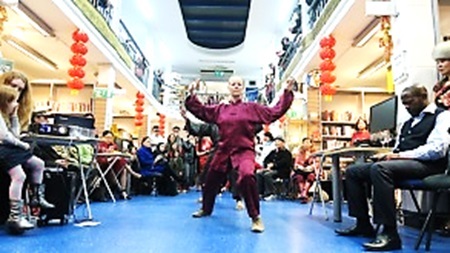 Libraries celebrated the Chinese New Year of the Horse at Charing Cross Library last week, with a programme of events including traditional music and dance, calligraphy, and martial arts. 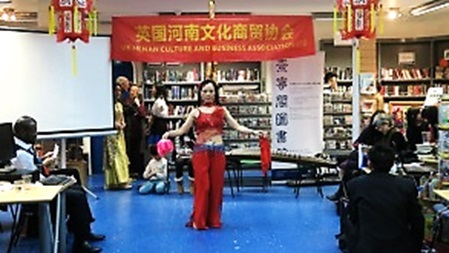 The Chinese Services Librarian, Chichy Li, based at Charing Cross Library, organised a stunning display of martial arts performed by HengLong Kungfu Club & Performance Team, music and dance performed by by Xuan Ji and Ms Wang FengYing and calligraphy by Cai, Weimin. Take a look at a gallery of images from the event, on the BBC China Service site. 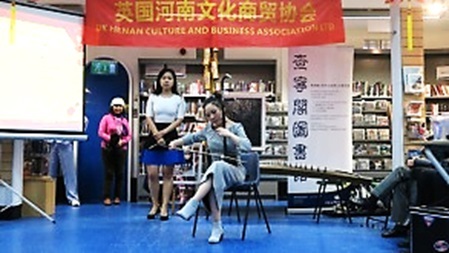 We also took the opportunity to launch the recently introduced service Chinese Corner, a scheme which offers the public and businesses learning materials and activities on the Chinese language and culture and is a networking opportunity for the local community. 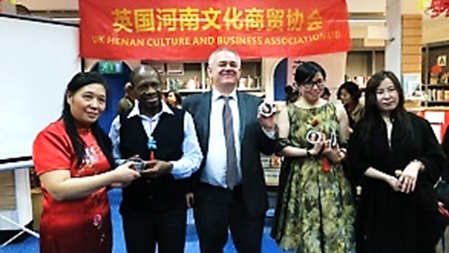 Chinese Hanban has generously sponsored the Chinese corner for 300 titles of reading and teaching materials and provides £4000 funds annually. 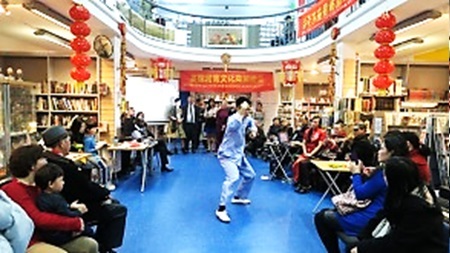 The Chinese Library is much valued and well-used by the local community, being located on the edge of London’s Chinatown with holdings of over 70,000 Chinese adult and children’s books, plus CDs for loan and reference – one of the largest collections of Chinese materials in the UK. Director of Libraries and Archives Mike Clarke thanked the Chinese community for their continued support and involvement. 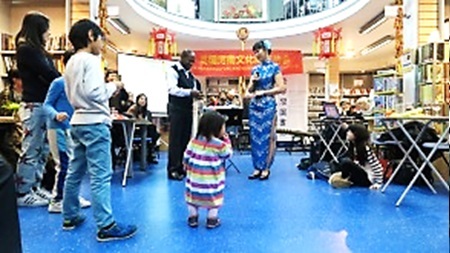 Charing Cross Library offers language classes for those who wish to learn Chinese, especially for business and those who wish to improve their English language skills. There will also be Chinese painting classes with Mr Cai based in Charing Cross beginning tomorrow, 15 February 2014. Contact the library for more information. Mu Ling visited Victoria Library last week to give a workshop on Chinese calligraphy. We started by copying – as young children first learning calligraphy do – the character for people. She elegantly drew the characters for The Year of the Horse, Wind, Earth, Fire and Water, which the group copied. There were nine fascinated attendees. We have since received this lovely piece of feedback, and will be considering holding similar events in the future. Today is the Chinese New Year 2012, the start of the Year of the Dragon. London’s main celebrations will be held on 29 January. You can find out more about the parade, ceremony and fireworks on Visit London. And it seems like a great time to tell you more about Westminster’s Chinese Library, right in the heart of the West End. 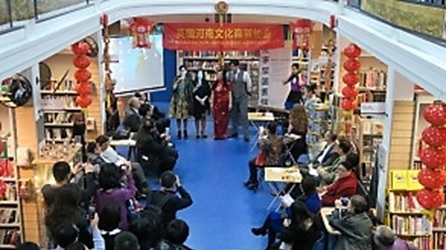 With London’s Chinatown being located just off Leicester Square and attracting the Chinese community from across London and the South-East, it is no surprise that the Chinese Library service is based at Charing Cross Library and holds one of the largest collections of Chinese materials in any UK public library. Over 50.000 Chinese adult and children’s books for loan and reference, including the most popular fiction books and top sellers. There are books by Chinese authors and popular Western writers in translation. Romance stories are very popular, as are Kung Fu thrillers and Manga series in translation. The non-fiction collection covers all areas, including art, business, history, social life and travel. There are also more than 80 different kinds of magazines and periodical publications plus Chinese pop and classical music CDs. CLSS – a national subscription service of Chinese books. We lend selected bulk collections to other library authorities for a fee to build up their Chinese library services. – come along and see us.